That's the multi-million dollar question, isn't it? Dubbed the luckiest woman in the world Joan R. Ginther has won not one but an astonishing four multi-million dollar pay outs. 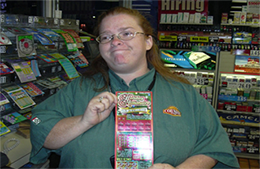 She won $5.4 million, then ten years later she won $2 million, two years after that she won another 3 million and finally, in 2008, she hit a $10 million dollar jackpot. According to statistics, the odds of winning the lottery four times for multi-million dollar jackpots is 1 in 18 septillion. To give you a frame of reference for that staggering number, there are only 1 septillion stars in the universe. There are only 1 septillion grains of sand in the world. A person with her kind of luck would only happen once every quadrillion years. Can anyone really be that lucky? Before you rush to judgment, consider this. Ginther holds a PhD from Stanford in—are you ready for this?—Statistics. Yes, that's right. Statistics. To make things more interesting, each one of Ginther's winning tickets were purchased at the same little convenience store in her home town of Bishop, Texas...where she doesn't live. Ginther lives in Las Vegas. The convenience store has since closed. While certain people suspect Ginther might have figured out the algorithm which would give her an idea where the winning tickets would be dispersed, people from her little hometown think that she is just incredibly blessed. Additionally, the Texas Lottery is so confident that there hasn't been any tampering with their contest they stand behind her also. The Texas Lottery is a government operated lottery which is overseen by the Texas Lottery Commission and is headquartered in Austin, Texas. Players must be at least 18 years old to enter and tickets must be redeemed within 180 days. Unlike most lotteries, players must choose a payment option—annuity or lump sum pay out—prior to submitting their ticket. Whether or not Joan B. Ginther is truly the luckiest woman in the world or whether she somehow found a way to beat the system is a question that will undoubtedly haunt her for the rest of her life, but if that is the case, then at least she is living a good one. The Texas Lottery has certainly been good to her.